Cody was Mr. Social with the kids all weekend, while I stayed holed up at home reading, writing, working out, cooking and cleaning. It was glorious. However, eventually Monday rolls around again, and for me, Mondays are long. Cody has a class that keeps him away until 7 p.m., which is generally when we are getting the kids ready for bed. We all miss that evening time that Cody usually has with the kids. Despite Bruno's rough night on Sunday, I had the best of intentions for Monday. I had planned to take the kids to the park and pack a picnic after Bruno's nap, which ends around 4. The weather was very gloomy, however, and rainy off and on. I entertained serious thoughts of staying in all afternoon, but with still an hour left before I needed to make dinner, I helped the boys get their things on and we went right outside to "the circle," not straying far so we could quickly duck back inside if there was a sudden downpour. I brought our Petersson und Findus music with us, an assortment of toys and Farzeuge, and was yet again reminded of how important it is to get outside. I am always shocked, as if it's never happened before, by how great it feels to simply sit under the wide open sky—even if it's cloudy or the air has an unpleasant chill. 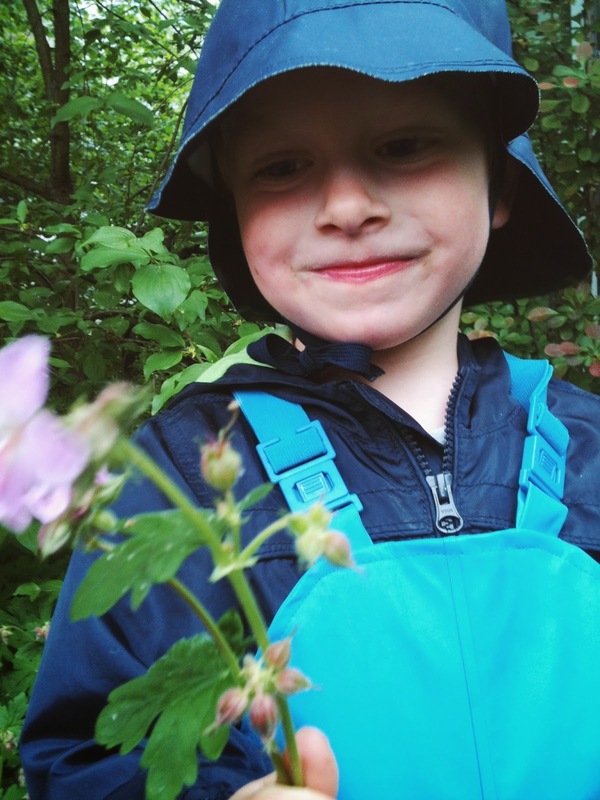 And even if the details of our time spent outdoors are less than impressive (like yesterday, when the boys seemed to just want to sit and eat rice cakes instead of play), It gives me a feeling of success. 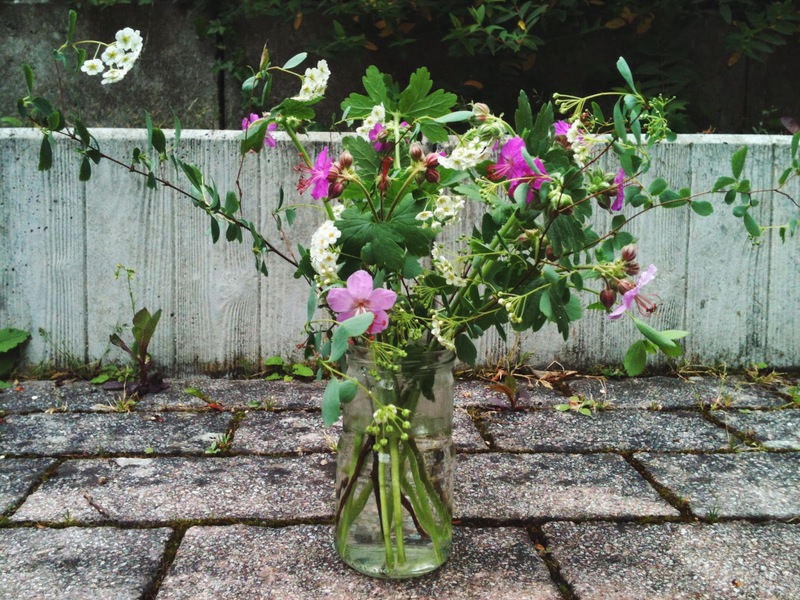 We foraged for a bouquet of flowers for the table, admired the huge flowering bush near the entrance to our building, and simply enjoyed the wet, green earth that surrounded us on all sides. Are there particular things like this that are initially challenging for you to do, kids or no kids, that clear your head and give you that feeling of having accomplished something worthwhile? I would love it if you'd share them with me. I am challenged to identify more ways I can be proactive about my days, enjoy them more, and help those around me enjoy them, too. After all, my habits are greatly affecting the habits of at least two little souls who watch everything I do. It's a topic that is certainly worthy of my time. Sebastian | Getting a closeup of Seb is extremely rare, and only happened this time because he was a bit zoned out and didn't realize for a second what I was doing. Right after I snapped this picture there was a hand to the camera. Also, Seb loves to wear ties. I think he gets his affinity for dressing up from his daddy. Photos from our days in N.C.—these souls are worth slowing down for. 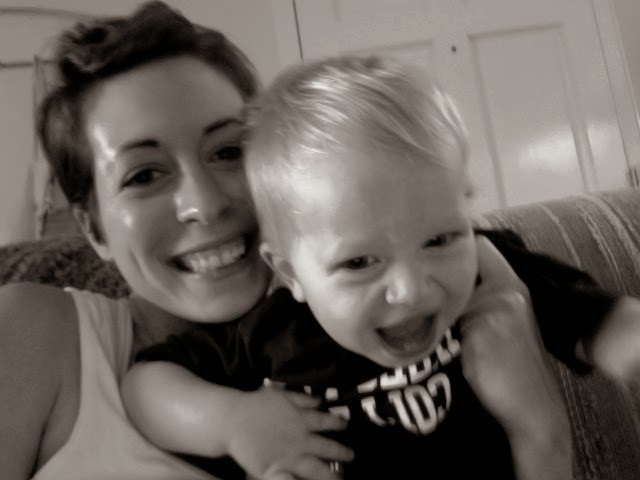 Also, now I have baby fever and the sudden urge to chop all my hair off... again. Someone intervene, and quick! Sometimes I read an article (it usually starts here) and then I get caught up in following link after link, absorbing an assortment of articles dealing with similar themes. I find myself completely in awe of—and incredible grateful to—the men and women who are living their lives purposefully and slowly and taking the time to share it with others. Living with purpose is one of the most difficult things for me, and I don't think I'm alone. Too many of us are trudging through our days and weeks and years, and time doesn't stop to give us a breather, or help us reconfigure things before a decade has past and we realize we have no idea what. just. happened. I've mentioned a couple times that I am drawn towards simplifying, and de-cluttering because the opposite makes me feel insane. But the second reason is this: I feel that if there is too much around me, piles constantly threatening my peace, and a to-do list a million years long, I'll miss it. I'll miss my life, my kids, my husband, my friends. I'll miss all of it and wake up in 50 years like I've been walking through a foggy forest my entire life with a dull sense of smell. Certainly there are seasons of our lives that are just hard, and there is nothing to be done but walk through them, one foot in front of the other. I'm not talking about those times. I'm talking about where our "normal" is set. Am I okay with the way I would describe myself and my attitude during those "neutral times" of no big transitions or life changes? As I wrestle with this question, among others, I thought I would share some links that have encouraged me, and have provoked me to think differently and fight the fog. I hope they lift your spirit this day and give you new energy as you prepare to start a new week with renewed purpose! Feel free to share any links that have encouraged you this week or weekend. 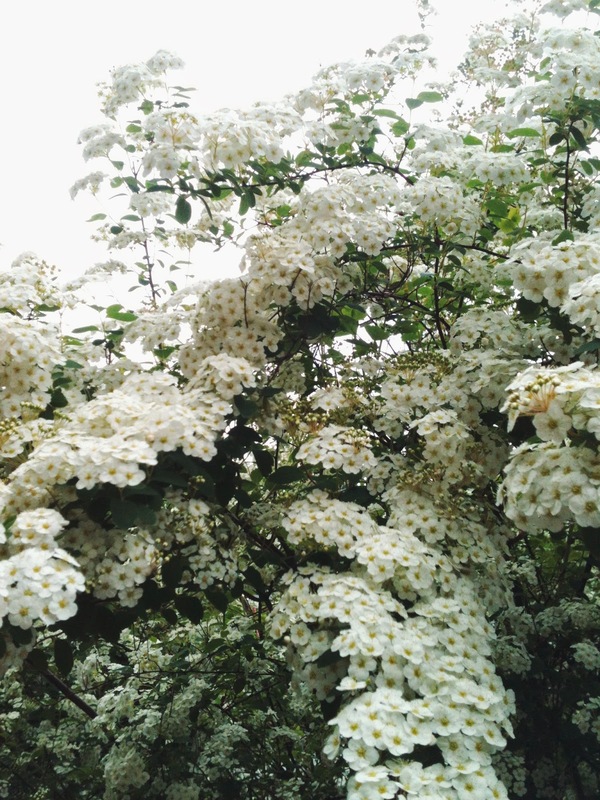 The Lost Art of Life Pruning (The Art of Simple). I've already linked to this once, but if you missed it, check it out. This is an article that will stick with me. Both Slow Your Home and Little Eco Footprints are new to me, but I'm excited to do some more exploring. The content looks excellent. 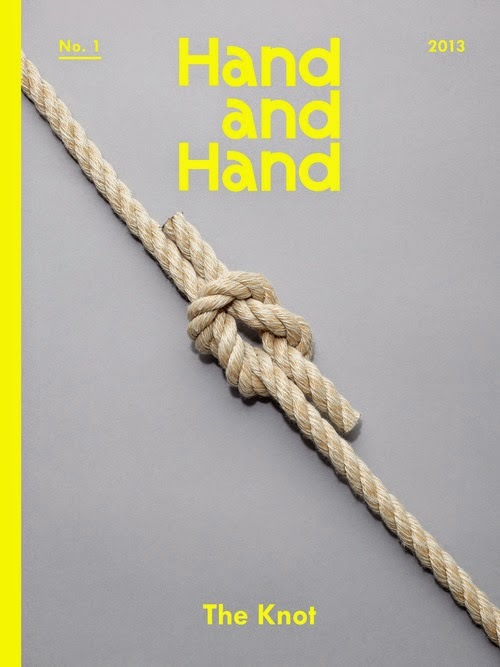 This is old news, but in case you never heard about it (like me), and are itching for some artsy reading this weekend, let me tell you about Hand and Hand. It's a magazine started by quilt designer/artist Carrie Strine. There is only one so far, released last year, and I'm hoping there will be many more. I've really enjoyed reading about artists like Shabd Simon-Alexander and Sally England, and numerous other articles all dealing with the theme "The Knot." 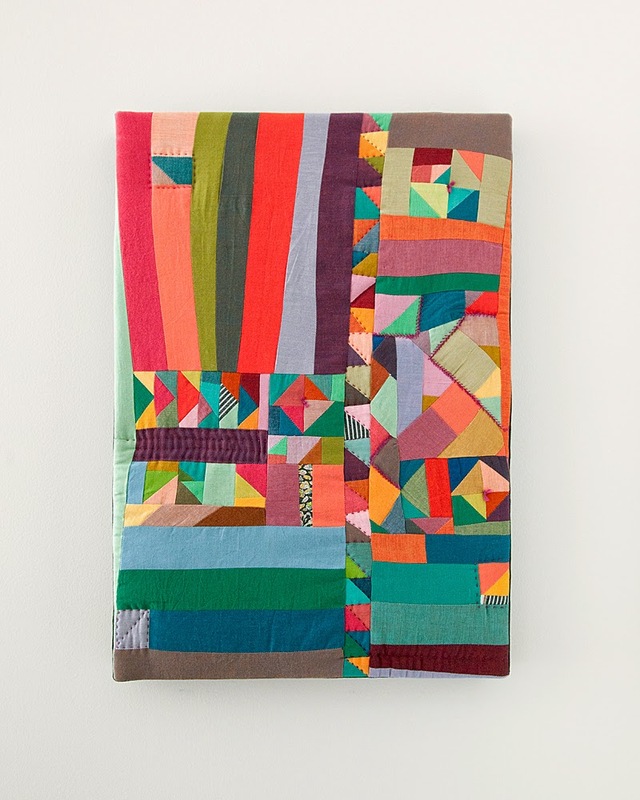 I am excited to follow the DIY instructions included for a Carrie Strine quilt. It looks like the perfect beginner quilting project, but without the bore factor of many typical beginner projects. Learn more about Hand and Hand here and here. Get your $10 digital copy here. If you snag a copy, let me know! I'd love to hear your thoughts. Do you have any suggestions for similar reading? Something that I don't talk about often, but that I'm terribly passionate about, is art. Specifically textile art. Quilting, embroidery, weaving, dyeing, knitting, you name it. I find few things as beautiful, or as thrilling. I might as well just come out and say it—it's been a long time coming—but becoming a textile artist is a long-term dream of mine. Honestly, even if it is something that never leaves the 4 walls of my house, that's okay. I really just want to learn, and practice, and create, and share in whatever way I can. This is something that has materialized just this year. I've had an art-shaped hole in my heart, an itch I've been dancing in cirlces to scratch, and now that I've located it, it feels a bit better. But I'm still working to figure out how I can make working with textiles a reality. Besides seeing our family and friends again, pursuing more textile work is the #1 reason I am excited to return to the states. We are trying to accumulate as little as possible during our tragically short year in Germany (3 months to go and I'm getting dramatic and mopey), and the last thing I need to be doing right now is acquiring tons of sweet art supplies that I have to turn around and ditch a few months later. I'm still getting my fingers wet, though. Curating my wardrobe, learning to knit, keeping up the with the happenings of some favorite textile artists, and reading about the art I'm interested in pursuing is helping me make it through. Last week I made a simple red cabbage dye for a half dozen Easter eggs. I thought Seb would appreciate blue eggs on Easter morning. When Cody arrived home, I practically trampled him with my giddiness about the eggs I was dyeing. "I just didn't know I would love dyeing so much! I want to dye everything!" His response was, "Mary, you really have to get your hands on some fabric and start." Having my husband's support and excitement about all of this is pretty wonderful. Still, sometimes I wonder if I have the diligence to be a full-time mom, wife, and artist on a tight budget. And then I read things like this. Hand me those pruning shears! I'm ready to get to work! I talked a bit about it in my last post, but too much stuff seriously creates a mental block for me. I can barely function, as ridiculous as that sounds. On the other hand, I also don't deal well with an environment that doesn't work well for us. I have far too many times avoided purchasing things that I knew we needed, but I just couldn't bear buying. I love shopping, but pulling the trigger on those purchases is difficult for me. "What if it's the wrong thing, and we just have one more useless thing filling our home??" I'm even worse at getting rid of things. Finding the balance of having just enough, and not just in quantity, but in those things that are truly useful to us is a difficult balance to strike, and one I'm sure I'll spend a lifetime pursuing. But isn't it worth all the work, if it enables us to live more fully-focused lives, doing the things we love? How do you combine your life and your craft successfully? Do you get stuck between it all, too? What keeps you motivated and inspired? P.S. From my dutiful observations it would seem that all textile artists are cat lovers. Is this true? Maybe that's the ticket. I have found that when something, anything, increases to a certain quantity, it ceases to be enjoyable to me and becomes a burden. Too many things around me, too many things on the kitchen counter, a laundry pile too big, a closet too full, too many toys in the living room... it doesn’t matter. I have a rather low tolerance for too much. Maybe it’s my complete hopelessness with numbers, but once going through my closet requires multiplication and division and subtraction, and dreaded fractions, I am lost. I prefer a 2 + 2 = 4 kind of a wardrobe. I never talk about math, but I think Abby's latest post has gotten into my head! Speaking of Abby, she asked if I’d be willing to share about my closet, how I keep it minimal and also enjoy a bare bones wardrobe. I was really excited by her request because I feel very passionately that it’s important to think about our purchases, about what we put on our bodies, and recognize that clothes do matter. The reality for most of us is that we spend money on clothing that we bring into our homes and wear. And no matter how low maintenance we are, or how afraid we are of becoming or being vain, we still think about clothing and have to buy clothing. So how can we do it better? I strive to buy fewer, quality pieces, and keep my staples simple and adaptable. Doing this gives me the ability to pull anything out of my closet in the morning with little more thought than, “Oh, I could put this sweater with this shirt today. Rainy out? I feel like matching the weather, or... maybe not.” I put my clothes on and... done. No stress. This works for me because I thrive on minimalism. This doesn’t mean it comes naturally to me at all, but I do love it. Some people love a large closet, but not me. I loathe a large closet. The second bit of possibly-helpful information lies in my recent history with clothing. Many of the thoughts and ideas I hold about building a useful and beautiful wardrobe began during my pregnancy with Sebastian. I had been the same size from late high school through college, and had never been forced to think through what to do with a body that does unpredictable and confusing things. I was in no way prepared for the roller coaster of body changes that were ahead of me, not just with my pregnancy, but with the postpartum days and breastfeeding. These days were frustrating and left me dreading leaving the house, made me feel self-conscious at parties, and kept me in a constant state of wishing we had more money to spend on clothes. It was not only exhausting for me, but for Cody as well. Fast forward to last week when Cody and I were standing in the kitchen talking about clothing (Okay... I was talking. He was listening like the great listener that he is) when, with an excited gasp I said, “Cody. Do you even remember the last time I had a wardrobe crisis? !” He couldn’t. And this was something to be excited about. For most of my life, any event that punctuated the week, like a party, going to church, shopping with friends, etc. caused me to frantically empty my closet and drawers in an attempt to find something—anything—that would look nice. It wasn’t that I wanted a designer wardrobe, I just wanted to be able to get dressed quickly and with ease, and feel comfortable and confident. I couldn’t understand why it was so hard. 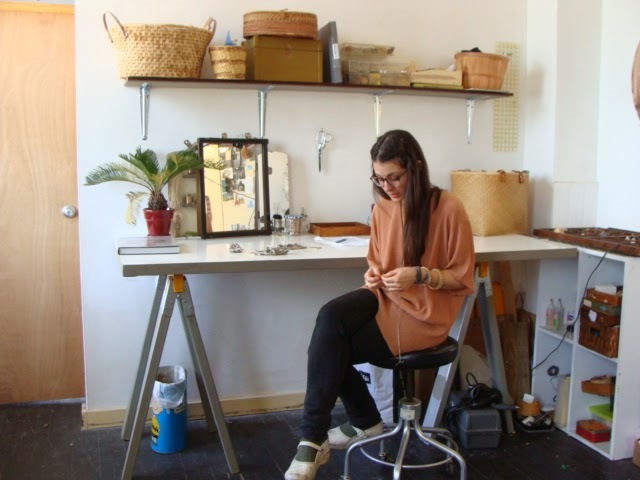 Oddly, the beginning of my make-peace-with-my-closet journey started with the birth, or rather re-birth of Madewell. A clothing store many of you have probably heard of that makes the best jeans of all time (My favorite here, a gift from my awesome husband). Madewell also makes perfect button-down shirts, and I got a few during my postpartum/nursing days with Bruno. 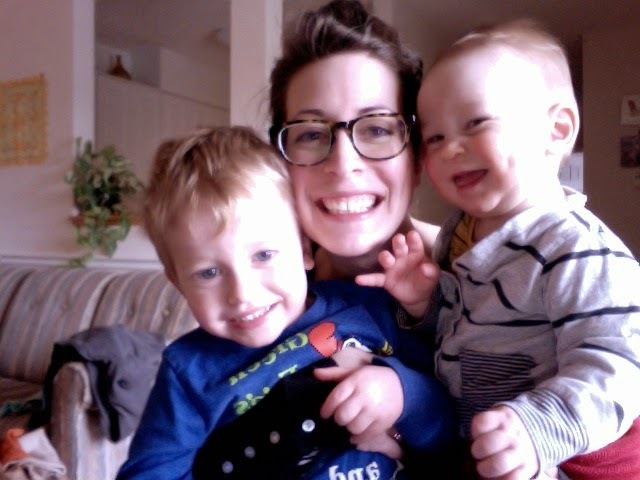 These shirts made me happy to get dressed and made it easy to nurse. My two favorites here and here. For the record, I can’t stand “nursing” shirts. I find that they always look frumpy and strange, and are always made of unflattering, clingy knit fabric. That’s a matter of opinion, though. This probably sounds extremely silly, highlighting a store as the beginning of making peace with my wardrobe, but I think there’s a good takeaway here. What styles of clothing are you drawn to? What stores or designers or artists inspire you? Likely there is a lot of overlap with the kind of interior decorating you employ or don’t, the fine art that gives you tingles up your spine, and the kind of clothing you love. 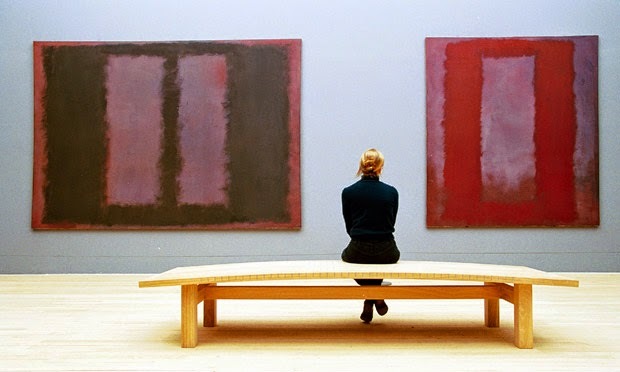 I’d be lying if I said I love all abstract art, but I almost cried the first time I saw a Mark Rothko painting in real life. I must say this fits well with my taste in clothing and silhouettes. Bold and understated—not that my wardrobe could ever come close to a Rothko, but you get the idea. How would you describe your style in one sentence? Do share! Once you identify your style, refuse to buy clothing, no matter how on sale, that doesn’t fit your style. It’s too easy to have a bulging, underused wardrobe full of “deals” that weigh you down. From my experience, if you don’t love it when you buy it, you won’t love it when it’s in your closet, and therefore, you’ll keep repeating those 3 shirts you have that you do love while the rest get moth-eaten in your closet. You might as well have saved those few dollars for a while to purchase something you would actually use and enjoy. In my opinion, if you can dress weather-appropriate for 1 week and not have to repeat an outfit, you have a large enough wardrobe. Would you agree? Do any of you have a wardrobe like this? Also, I have two pairs of jeans, and that’s enough for me. I have more to share, but I’ll save it for another day. Was this helpful to you? Interesting? Agree or disagree? I would love to hear your thoughts on your wardrobe or questions you have on the topic! I really thought I would get a non-portrait post up sometime between the last and this one, but here we are. Oh well. I have been working, however, and hope to share them soon. A couple having to do with how I approach my wardrobe and one on what I think about wearing makeup, what role it plays in my life, and a few of my favorite products. I hope these posts will be encouraging to you all as well as useful! But now, on to the portraits. Sebastian | It warmed up quite a bit, but we were hit last week with some more cool weather. I have a feeling that this might be the last of it. The glorious rays of sunshine certainly are welcome amidst the chill, and I am reminded to enjoy these last days of bundling kids in their sweet little vests and hats. Seb has also been battling a cold for nearly two weeks now, so he's stayed home from Kindy the last 3 days. 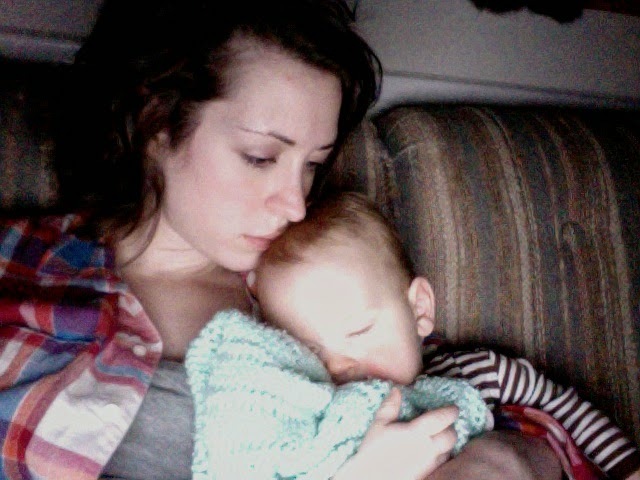 Mostly it's going well, but I'm finding it difficult to get my errands done. 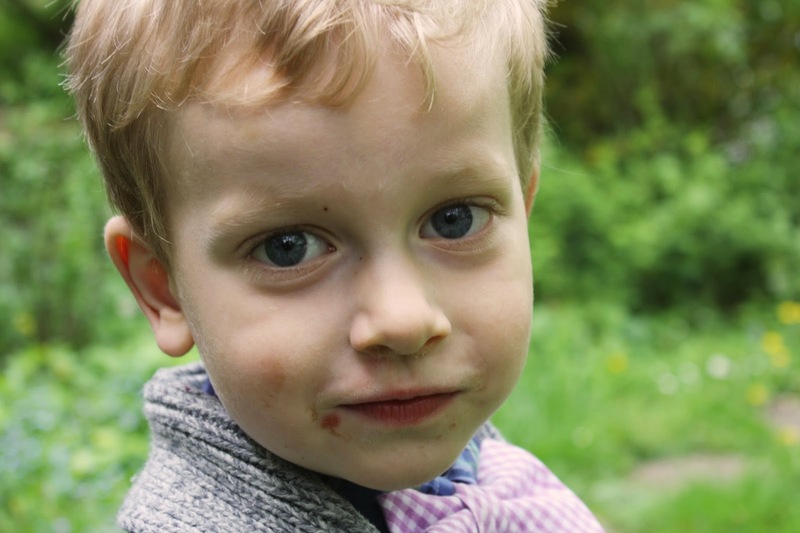 Seb has grown accustomed to being able to play freely all morning at Kindergarten, but at home, I split my mornings between play and errands, but mostly it's errands. Bruno is used to this, but Sebastian isn't. 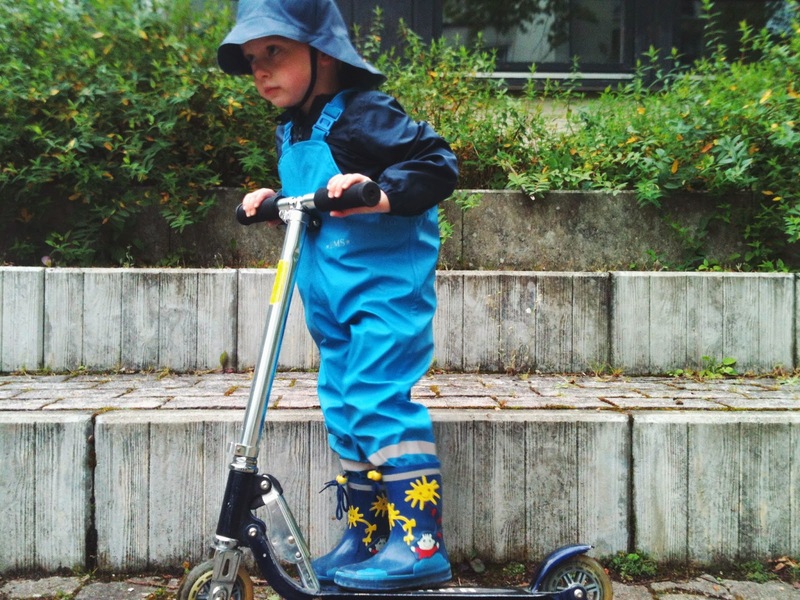 We have daily battles over him wanting to take his bike to the city (he has to learn to listen a bit better before that happens), which are just a stressful way to start the day. I find myself loosing patience quickly on this topic. He gets to ride his bike for at least an hour, if not 2 or 3 on a daily basis, so the "More more more" attitude is exhausting. 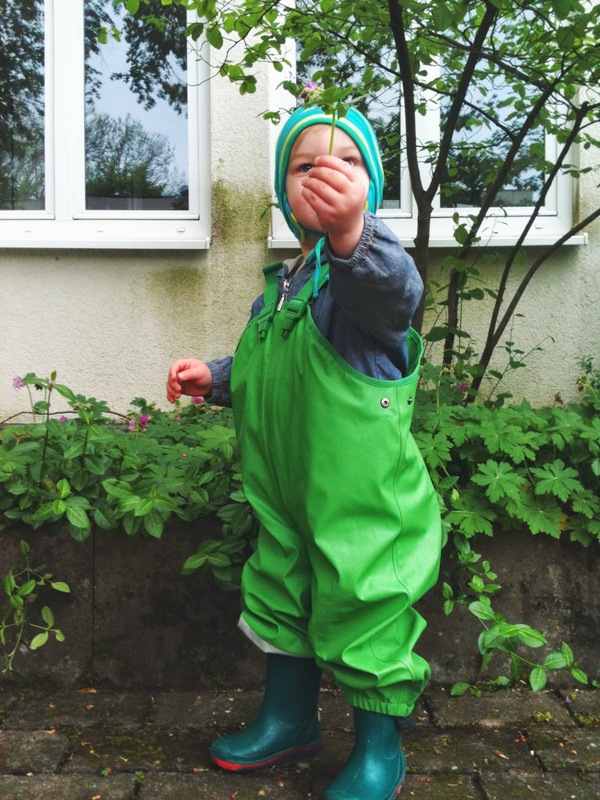 It seems that the more we go outside with our kids, the more they want to be outside! We go out as much as we can, which is a lot, but my chores, like cooking, cleaning and laundry are sorely neglected because I just can't be outside all day and get all my inside things done. If Seb and Bruno woke up early, we could get started by playing outside and then run errands, but we can't do that and be back in time for lunch. 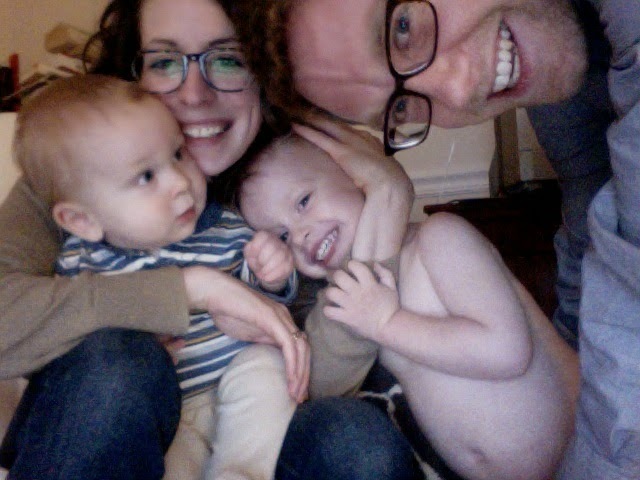 I am starting to get nervous about how our lives are going to change in this respect once we're back in the states. What will happen when we have to drive everywhere? How do you balance your kids play time with your chores and responsibilities? Does this "always more" attitude resonate with you? 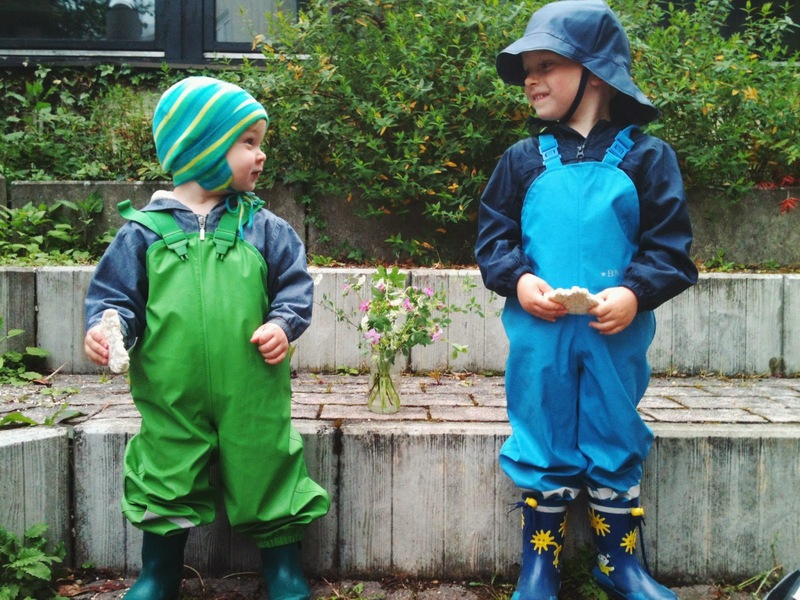 On average, how much time do you spend outside with your kids? Is it daily? Bruno | The theme of this week must be survival, because Bruno is teething like I've never seen teething before. Until this week, I honestly dismissed most "teething talk" from parents because I was like, "Okay, so they drool, are a bit fussy, yada yada yada, but it's not that bad." Clearly I had never had a toddler teeth like Bruno is teething. I'll spare you all, but let's just say none of us are getting much sleep these days. However, and most importantly, I'm so thankful for a husband who helps with both the kids all night long, and for the way Sebastian can sleep through most anything, for the opportunity to snuggle warm little children in bed with us, for hot coffee in the morning, and for tylenol. This, too, shall pass. Tonight we're going to make up our couch bed so both kids can fit in bed with me tonight and Cody can actually get some sleep in the living room. Wish us luck! Sebastian | This big kid learned to ride a bike over the weekend. (I took this picture while Cody ran back into our apartment to get Seb's helmet). He has had a balance bike since his 2nd birthday, and then a couple weeks ago he started riding a bike with training wheels. the combined experience of balancing, and then pedaling meant that he literally got on his bike without training wheels and started riding! Cody was with him at the park when he started, and was shocked that he didn't need any help. We're so proud of this little guy. He doesn't want to do anything else now, and keeps talking about buying Mama, Dada, and Bruno bikes so that we can ride with him. Bruno | This face. Bruno is teething constantly, and gets worked up pretty quickly. Everything is difficult from changing his diaper to putting his shoes on to getting him to realize that hitting is not actually a form of affection (unless you're a couple of lovestruck teenagers, that is, but he doesn't need to know that yet). But the other half of the time he's like this. He is super affectionate and wants to give us all kisses at bedtime. A few nights ago, he said, "Kuu Kuu!" to Cody. It was dark, as he was taking him into the bedroom to put him to sleep, so Cody naively accepted the kiss. Bruno had let his pacifier drop out and was sticking out his very slobbery tongue. Cody said he had Bruno's spit dripping down his chin (!!!! ), but Bruno was content that he got to give Daddy a kiss, and went right to sleep. Ha! Oh the love of a parent, right? I have been gearing up for this changing weather with thoughts about what few items I would like to purchase for the warmer months. After moving to Germany in August, I must say that my thoughts on my personal wardrobe have changed drastically. I left most of my closet in Ohio, and brought only the things I truly loved and a few that I didn't love, but knew I would wear nonetheless. To my surprise, my suddenly limited wardrobe gave me the extraordinary freedom to finally be creative with my wardrobe. I've never been more excited to open my closet and get dressed for the day. If I lived in a land of eternal Winter or Autumn, I would be set. I am still not even close to being bored with my tiny collection of sweaters and cardigans, button-downs, my 2 pairs of jeans, and a few basic tanks and tees for layering. I also have 3 scarves that I rotate, and most mornings I have a hard time deciding which to don, because I still love them all. I purchased one in Berlin a few years ago, one is from Italy and given to my by my dear friend Courtney, and the other I purchased this winter at the Reutlingen Christmas market. My wardrobe is not the center of my universe, but it means something to me. I get joy out of the few things I have, and I feel like they express who I am, as much as something like clothing can, of course. Basically, I feel comfortable in my clothes now. I wear the clothes, the clothes don't wear me. The one thing I always want more of, however, is shoes. I am a shoe person. Are you a shoe person? It's great to be a shoe person. Except, I have discovered, when you want to buy a pair of Birkenstocks and you live in Germany. But, you say, Birkenstocks are a German-made shoe! What could be more perfect? Well, I'll tell you how it is. I have lived in Germany for 8 months and have only now just realized that I have yet to see one pair of Birkenstocks worn out of doors. One can buy them at nearly every shoe store, but they are considered to be practical orthopedic shoes that people wear as slippers, or Hausschuhe. I'm pretty sure every German owns a pair, but they don't leave the house. And here I was literally about to hit "sofort-kaufen" on German Ebay for a pair of my own. I don't dare buy them with the intention of only wearing them indoors while in Germany, because I know myself too well. I'll wear them outside, I just know it. I'll wear them to the grocery store and I'll wear them to H&M, and I'll wear them to the park. Once those babies hit my feet ain't nobody going to peel them off. 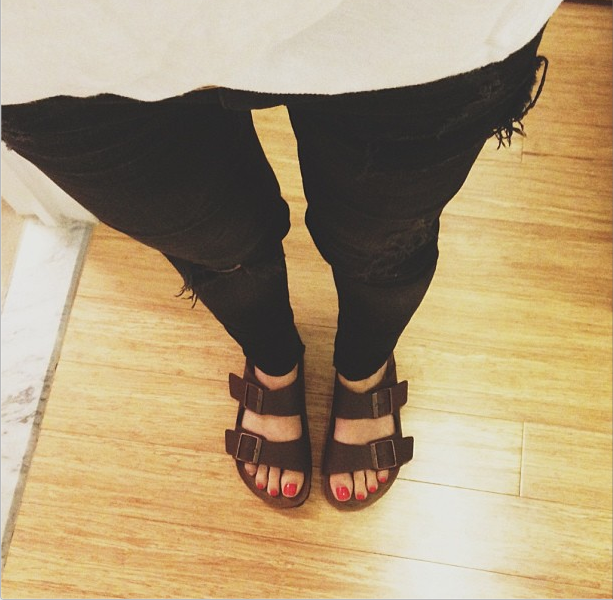 And so, my Birkenstocks purchase will wait. It's not that I generally care about what other people think of my shoes, it's just that if you're living in the country that invented the Birkenstock and people in said country say that it is strictly a house shoe, then you adhere to their standards until you leave on a jet plane to the country wear even flip flops (gasp!) are acceptable. Do you like ugly shoes? I know Bethany does, and I love her for it (yay ugly shoe club!?). It must be our mutual Germanness. Side note: I think all ugly shoes were invented in Germany. What are your favorite summer shoes? Do you thrive on a limited wardrobe? What purchases do you have planned for the coming months? Update: After talking with our German friends, they assured me that no one would look at me cross-eyed if I wore Birkenstocks out of the house, but also that they did think it was pretty hilarious how Americans view them as just another pair of sandals. I love discovering stuff like this. P.S. 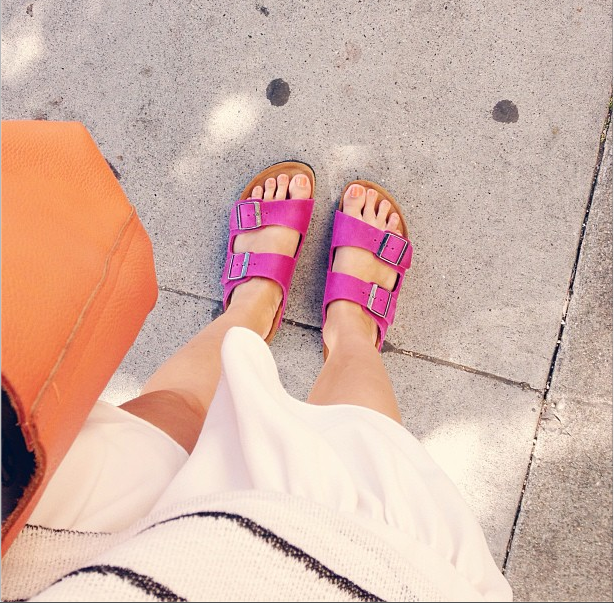 Here is a post by Design Mom about Birkenstocks trending, and one by Say Yes. 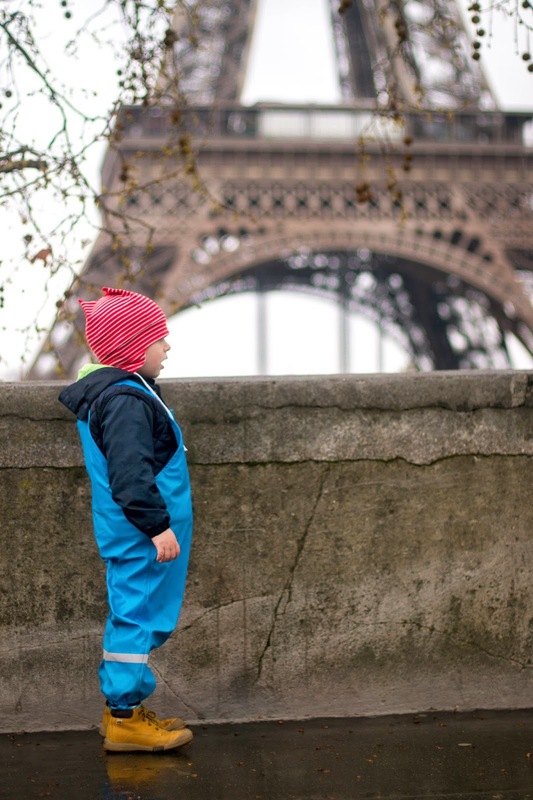 Sebastian | I'll admit, I'm cheating just a wee bit including this shot of Seb from our trip to Paris last week. Tuesdays are my cut off day, and this portrait was taken on a Tuesday, so it still counts, right? Right. He was so excited to see "the tower" and was very disappointed that we couldn't go up into it. I love his blossoming sense of adventure. He regularly asks us if we can go someplace new. This is just the beginning, kid. Bruno | He is stringing multiple words together at a time now, with lots of animated gesturing and funky noises thrown about in order to get his point across. Right now, as the weather has warmed up considerably and we have our wheels back, we are spending more time in the city again. We love this, and Bruno makes it a point to frequently beg to sit at a table, or bench and get something to eat. 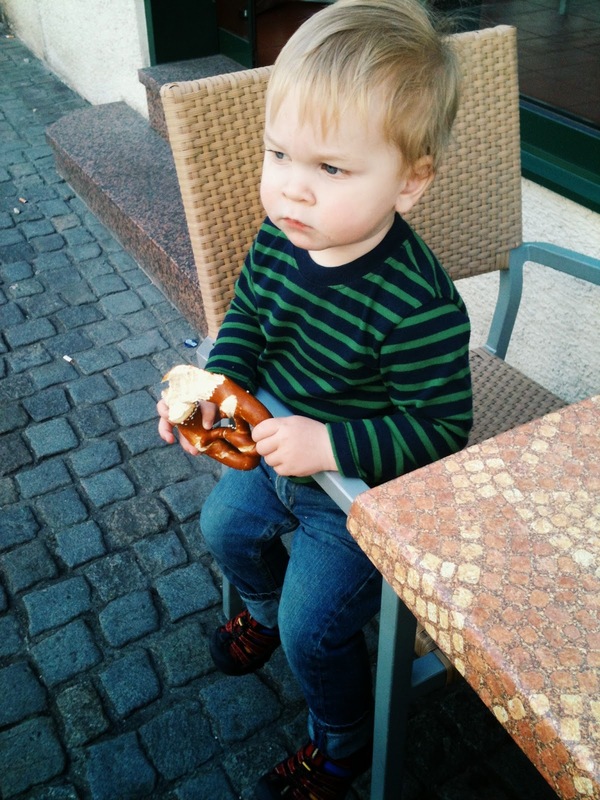 I love that he doesn't want anything extravagant—just a Brezel, and a spot to sit and people watch. 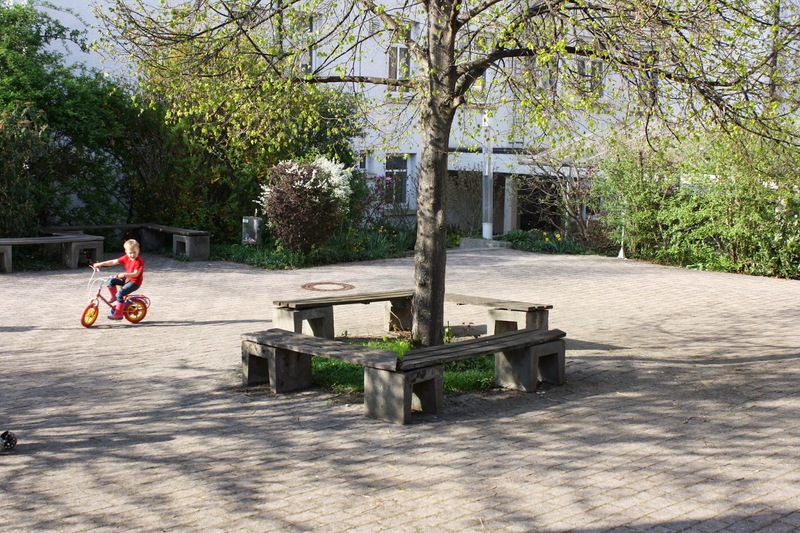 These are some of the moments I will miss most about living in Germany. Somehow we'll figure out how to have similar ones in our next home.